Andrew Purcell | Spiros Law, P.C. Andrew J. Purcell, a native of Kankakee, returned to his roots after 16 years of practice in Chicago. The rewarding experience of helping injured persons and their families led Andy to join the like-minded team at Spiros Law in 2015. He brings his skills as an experienced courtroom lawyer to serve clients in the Kankakee area, Central Illinois, and beyond. 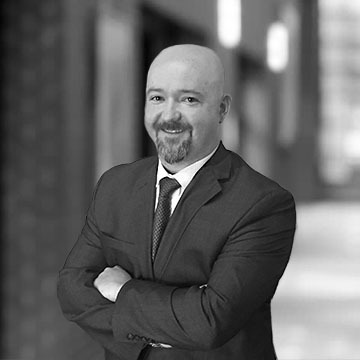 His career includes 12 years, seven years as a partner, at a national law firm in Chicago, where he handled complex cases involving industrial accidents, electrocutions, auto/trucking accidents, fires, explosions, and building collapse. Andy is a fierce advocate in the courtroom and has been involved in 30 trials and more than 100 arbitrations and mediations. Andy’s results for injury plaintiffs includes obtaining a $5 million verdict for a 13-year-old girl who lost her parents and infant brother who were killed in an accident with a tractor-trailer. It was believed to be the largest wrongful death verdict in Dalton County, Georgia at that time. He has obtained favorable settlements for his clients in a variety of cases, ranging from auto accidents to a fatal helicopter crash. He is a graduate of Eastern Illinois University and The John Marshall Law School in Chicago, and was a member of the JMLS Law Review and a national Moot Court competition team. Andy is licensed in Illinois, and before the U.S. Court of Appeals for the Seventh Circuit, the U.S. District Courts for the Northern and Central Districts of Illinois, the Northern District of Indiana and the Eastern District of Wisconsin. From 2006 to 2014, Andy was named to Illinois Super Lawyers Magazine’s Rising Stars list, recognizing well-respected attorneys under age 40. Andy is a member of the Kankakee County and Illinois State bar associations. "Andy Purcell made my case as easy as possible on my end. He knew I was dealing with alot of pain and recovery. 10/10 I would recommend giving them a call!" "Mr. Purcell is an outstanding lawyer and clearly one of the best in the area. Mr. Purcell handled my case in a very professionally matter. I would gladly recommend him to family and friends." "Andrew was very professional and listened closely as my father explained what he wanted. This was not one of the million dollar deals that you read about, but Andrew treated my father and his claim as if it were. He was treated with first-class attention and first-class representation. I appreciated all that Andrew and Spiros Law did for my father. " "If you are looking for an attorney to truly represent you in the best way, my experience with Andrew was just that. He always took the time to talk and explain and answer any questions I had. Andrew was quick to address any issues in my case such as making sure the insurance company was paying on time and getting bills paid." "Mr. Purcell was extremely helpful with any questions we had and responded in a timely manner. The service we received was excellent and I highly recommend him." "Andrew did an excellent job on my case when I was in a car accident last year. I was injured and couldn't drive to meet with him so he came to me and always kept me in the loop with what was going on. He is very professional, responsive, and made things as easy for me as possible." "This firm is great. Andrew Percell is a straight shooter. He knows all the jive but keeps it clear with his clients. I felt like a person there not just a client. I must say I did not expect the compassion and professionalism to blend so well. Go no further this is the team you want on your side."